Note: Manager and Account Owner account types are required for this function. 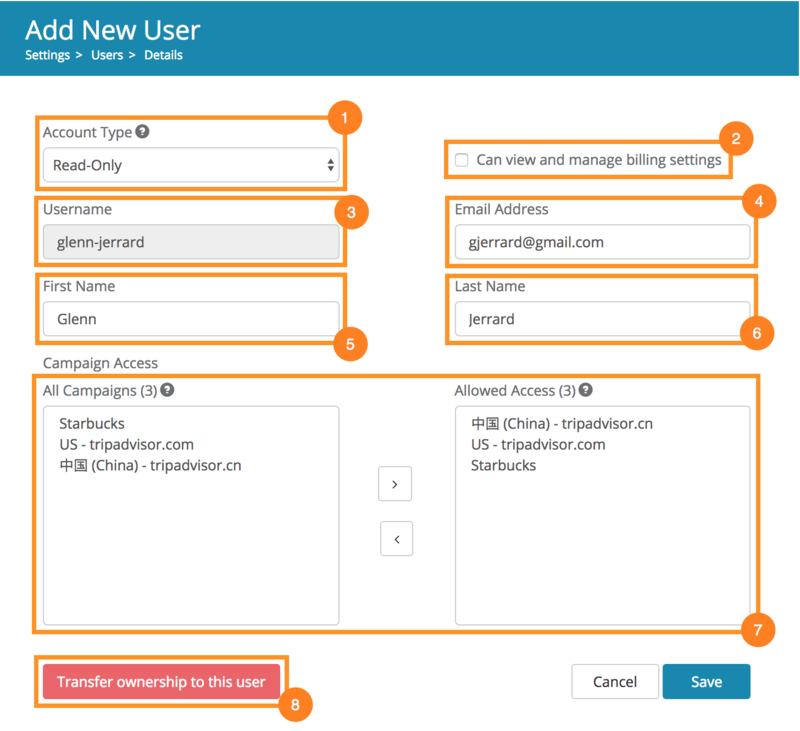 Dragon Metrics provide 4 account types (roles): Account Owners, Managers, Standard Users and Read-only Users, each account types have different permission levels to various features inside Dragon Metrics. A user's account type can be modified by choosing the proper account type for the selected user. Account Details page (Contain potentially sensitive information like billing, account limits and payment history) is accessible only to the Account Owner user of the account by default. If you'd like to grant other users permission to view these information, check the Can view and manage billing settings checkbox. Login ID for the user, must be unique and cannot be changed once the user's been created. Login Email for the user, system Emails to the user will also be sent to this Email address. It's possible to control which campaigns can the user access and which cannot. To give access to campaigns, simply select them from the list of all campaigns in the account on the left (use ctrl+click or shift+click to select multiples) and click the right arrow. To remove access for a campaign, click on the campaign name in the list on the right and click the left arrow. Each Dragon Metrics account can only have one Account Owner user, which possess the complete control for every aspects of the account. If you are the Account Owner user of the account and would like to transfer the Account Owner role to another user, click Transfer ownership to this user button under user details page of that particular user.